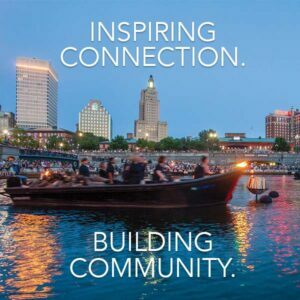 With the generous support of Lead Access Program Sponsor Bryant University, its Graduate, & Physician Assistant Programs, WaterFire board member Mark Scott and the help of WaterFire Access Boat Captain Mark Karas, along with volunteers and individual donors, WaterFire Providence has been able to bring back the Access Program to the WaterFire 2018 season. WaterFire’s commitment to include each and every visitor resulted in WaterFire’s Access Program; The Access Program is offered by WaterFire to accommodate individuals with disabilities so they may enjoy the magic of WaterFire free from the physical restrictions and challenges the outdoor location might present. Ms. 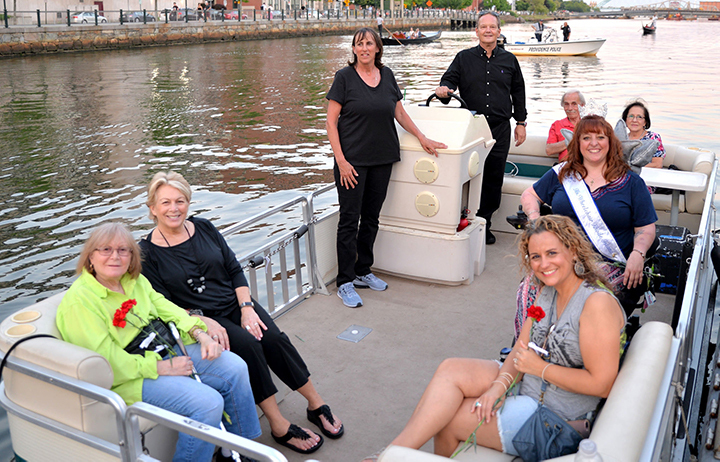 Wheelchair Rhode Island and other WaterFire visitors enjoy the first Access Boat ride of the 2018 WaterFire Providence season. Photograph by John Nickerson. 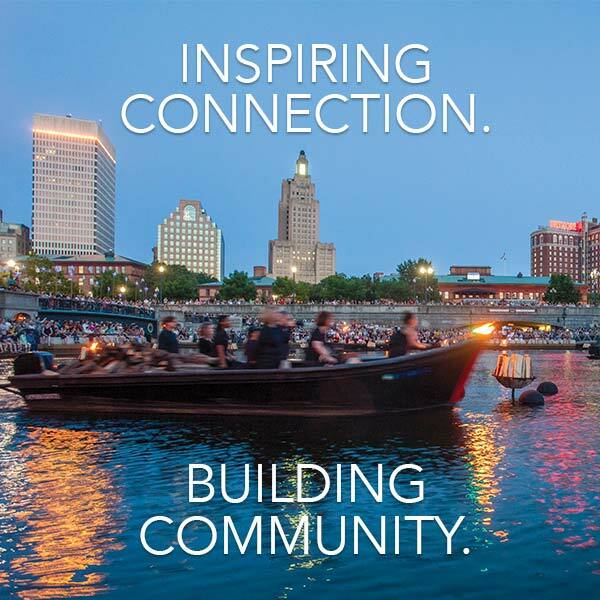 The Access Program Boat Dedication will take place prior to the lighting ceremony at the guest boat dock adjacent to Memorial Park and the College Street Bridge at 6:30 pm. The public is invited to celebrate with us as we toast to the new boat and reveal its dedication. Access Boat donor Mark Scott and representatives from Bryant University, its Graduate, & Physician Assistant Programs will be lighting the wall and the Access Boat will officially receive its name, Sandra Jane. WaterFire Providence is excited to welcome Bryant University, its Graduate, & Physician Assistant Programs as the Lead Access Program Sponsor. “We are honored to partner with WaterFire as two organizations dedicated to enhancing people’s’ lives. Together, we recognize and celebrate the value of all people in our community,” said Bryant Provost and Chief Academic Officer Glenn Sulmasy. WaterFire board member, Mark Scott, generously donated the pontoon boat used for the Access Program in memory of his sister Sandra Jane Scott-Peavey, who passed away at a young age but was always dedicated to helping others and spreading happiness. WaterFire Access Boat Captain Mark Karas’s dedication to the Access Program throughout the years has been unprecedented. When WaterFire’s original Access Boat was unfit for use, he spearheaded fundraising campaigns and engaged many longtime volunteers and boat captains to do the same. Captain Karas is truly moved by the donation of the new boat and is honored to be a part of this Dedication. how can i get a ride on the accessible boat? 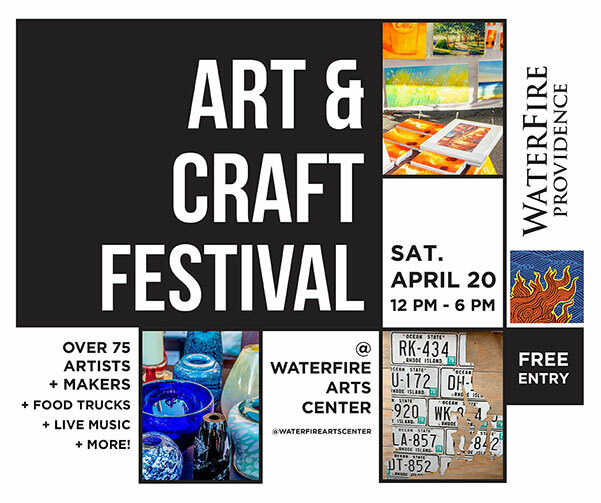 Hi Joanna, please email access@waterfire.org to make a reservation.